I work for two attorneys, whom I am going to call HE and SHE. They are very different. HE doesn’t seem to think much about his surroundings, and SHE could become a decorator. SHE loves moving the furniture and paintings, putting out pretty boxes for functional items like paper clips, and SHE like a somewhat crowded decorating style. SHE also saves things, like furniture and bedding, in a storage unit so that SHE can rotate items when the whim strikes her. When I ask HIM about getting rid of something, HE generally either tells me to get rid of it, or HE tells me that he’ll think about it later. HE has about a 3 minute tolerance for decluttering tasks. SHE gives great consideration to all the questions: Can we use it somewhere else? Will we need it some day? Could I use it at home instead, etc. As I said, SHE likes to keep things. I’ve gotten rid of about 150 hanging file folders (I think we’re safe with the 150 empty ones we have left plus the 400 or so that we have in current use), a box of boxes (arrived at our office June 2010 and never even opened), a bulletin board (last used??? ), old legal exhibits (once the case is over, they’re junk unless it goes to appeal), and a dozen three ring binders. Yes, there’s more I’d like to get rid of but in getting rid of what I did – decluttering and organizing the new closet – we have been able to eliminate the need for 2 tall storage units and a 36″ lateral filing cabinet. Yes, HE and SHE may be uncomfortable with my approach to consolidating office supplies sometimes, but they sure like the results. 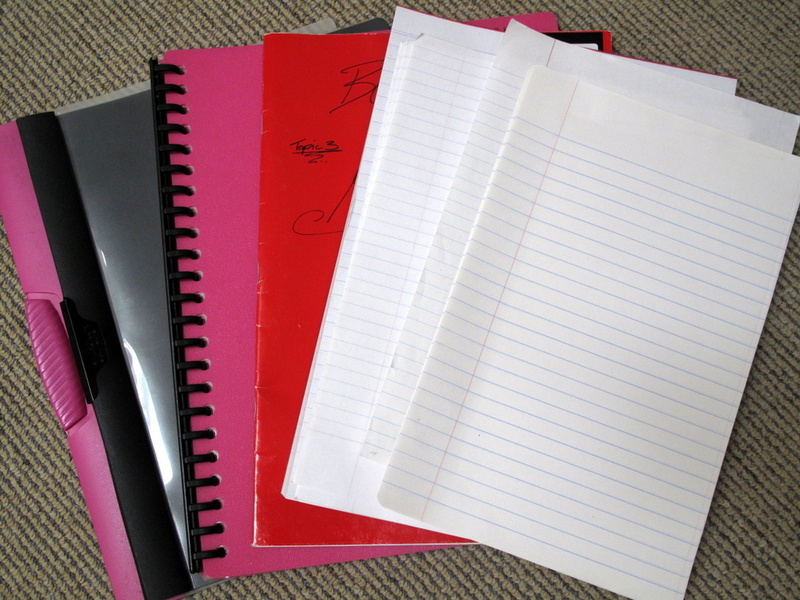 Do you have too many stationery items ~ Folders, papers, pens, clips, staplers…? If so now is the time to weed out a few. I don’t know if this mission gave Cindy ideas for today’s post or whether it was a sheer coincidence but it sure has worked to promote a consistent theme throughout the entire post today. These items were relinquished during some recent decluttering in my craft room. Stay tuned for tomorrows post of the big craft room reveal. 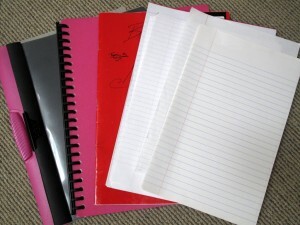 Folders, notebooks and loose leaf paper. I sent my car in for a six month extended warranty check today. It turned out I needed new brake pads and discs on the front and I have been having a stalling problem that they fixed as well. About $700 later I will get my care back. What is there to be grateful in that you might ask. Being able to afford mechanical repairs on my car when they are needed even if they are unexpected. Thank you my darling husband for being such a good provider, we are a great team. Decluttering as well as working in the garden, etc. aren’t always enjoyable, but the end result is great. After a few times of getting a good end result, it makes the task easier and enjoyable as you look forward to a good ending. I’ve really appreciated the insights – I’ve been a packrat since early on in my life, but am finally seeing the light (at a still young age compared to many – I just turned 21 a few months ago). Sometimes it certainly feels like I’m progressing backwards (got a really nice couch from a friend, but had to take a crappy couch and chair as well… working on craigslisting the two I don’t want, and got rid of one of my couches). Fortunately, a lot of it is progress forward. Many of the things at my parents house I will photograph and then get rid of (sentimental clutter from an early age), and I’m reducing what I have at my college house (renting with friends) so that I get used to a non-cluttered life. I plan to start following mini-missions at the start of July (finals week/end of term stuff means decluttering is only a bit of use-it-up in the kitchen and a few pairs of holey socks). Welcome Amanda. As they say, awareness is the first step, and you’re starting young. I look forward to getting to know you better. 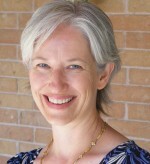 Hi Amanda, welcome from me too and thank you for your patience in reading all the way through the archives. I love it when young people such as yourself become enlightened to the perils of consumerism and materialism at such an early age. Good for you and I hope you influence more young people around you. I look forward to hearing more from you in the future. Perhaps when you are done with finals week you might like to write a guest post for me with your story on how and why you have become minimalistic at such a young age. I work in a office alone but support 18 people who live along the East Coast of the U.S. The young lady who had this job before me 7 years ago had a supply stash that I am still using. I think I could match you paper clip/binder clip one for one. I have NEVER purchased these since I took this job. I have been slowly sending office supplies to my staff a little at the time but I still have one drawer filled with things. We do use them, just not quickly. I think I will take a stab at sorting through them and seeing if anything is obsolete and move it out the door. Since our supplies budget is very tight, I tend to keep anything we might use but pens dry up as do glue sticks and white-out. Guess I know what I can start purging. I have a physics class that uses paperclips like none-other(we use about a box a term that get lost to who-knows-where), but when I went to go retrieve some from the supply closet, there were literally 40 boxes of them (10+ years worth), plus dozens of boxes of tape and markers. I was shocked. There’s no way we could use all of those other things. We had these fancy connectors for hooking to the fabric of a cubicle. Why, I ask, as we have no cubicles. Those boxes that I got rid of fit a piece of paper, but not a file folder, which is probably why they’d never been used. We have ink for printers that are long gone. That’s the kind of stuff that obviously can be moved along first. Once the easy stuff is gone, you can take a harder look at what is left. Amanda, Your story reminds of how my children’s school used to do supplies. Literally, 48 pencils were required for each child. That’s 768 pencils per year. Plus, a box of markers, 6 glue sticks, etc. It was ridiculous, and infuriating to me, as it was a waste of money. One year I caught a teacher about to throw ALL the markers away. I took them, had the kids check them for “juiciness” and donated those that were OK to a local public school. The next year, the teachers were handing left over supplies back on the last day of school, which was a big improvement. Now the school buys all supplies, and the teachers can get what they need, leaving the rest for the others. Makes a lot more sense to me. The Primary combined Intermediate school my children attended gave each classroom a stationery budget but whatever money was left over in term 4 was allowed to be transferred against the annual class camp budget – this reduced what had to be fundraised or contributed by the parents. So the teacher was keen and the parents were really keen, one parent found the scrap books needed at The $2 Shop instead of paying $5 from the stationers, and when the teacher put out the word that she needed ringbinders, someone brought in excess ones from their workplace. It was a great system. And we enjoyed the reward of a very small class camp fee at the end of the year $15 for 4 days I recall. I think that’s a fantastic idea Moni! Oh my SUPPLIES!!! I once worked as an Administrative Assistant for a Hospital Rehab unit. The people before me had so overstocked that you couldn’t find anything. I took everything out of the supply cupboard and had one of the maintenance guys come build in cubicles and a few pull out trays. Then I went through everything, tossed the outdated stuff (lots of that) and put the good stuff in the cupboard. I labeled the cubicles. The trays held the small things like boxes of paper clips, etc. When I got done the unit was so excited they asked me to organize the rehab supplies. Then other units started coming to see and started doing the same thing. I couldn’t figure out what was so special. To me it was just common sense. Another thing I did was make up preloaded charts. Each patient had to have a rehab chart that contained certain standard forms. I thought it was stupid for a therapist to get a new patient and have to go to the cupboard and grab all of those forms and start a new chart. Every time a patient left I would take the chart cover and fill it with new forms. That way when we received a new patient I was able to hand the therapist a new chart already made up and all they had to do was get forms when/if they needed them as they filled up the original ones. Saved time for them and I was always sure each chart had what was supposed to be in it. I had forgotten we had this tub of hanging file folders in the shed until we finally got so much stuff out of it that I found it hiding under the work bench. I’m giving them to our church secretary. Going, going, GONE!! Why do our minds go first to – “buy more!” instead of “reduce!” or “organize!” Why? Just last week we had a major reorganisation at work, as a result my employer told me to research buying a 2nd storage unit for the office. However, I just spent an hour reorganising how we used the storage space we already had, got rid of the outdated stuff and put the shelves in a more useful position in the cupboard and low and behold, it now all the extra bits fit in the original cupboard and no new one needed. Not sure if its Cindy or Colleen writing about the car repairs but I agree that there is a lot to be grateful for even just havin a car in the first place).I just paid $400.00 to fix a clunking noise in my little car (cv joints) BUT I am so grateful that I was able to get it fixed and that I hadn’t broken down in peak hour traffic on my way to work .I would have hated that so I was very grateful that the problem was diagnosed and fixed before anything bad happened.AND I have the nicest mechanic in all of Australia .He and his business partner are very professional and very kind.The children all had old cars which they kept going long after their use by date and they would fix little things without charging! !They are exceptional and I am very grateful that theyare in our lives. Hi Jez, it was me who wrote about the car. I look forward to the day that my car is out of it’s extended warrantee and I can start taking it to someone other than the dealer for servicing. I feel I will get more personal service, more honesty and probably a better deal. That may be unfair but I can’t help but think I am being ripped at the dealer somehow. Yes Colleen, my daughter can’t wait to get through her new car’s period of warranty and get back to our guys again. They are the real deal ! They know the whole family and now my daughter’s in-laws as well. I’m quite sure my $400.00 bill would have been $900.00 if I was still with the big car dealership. Good timimg. Think I’ll have to visit my lawyer. My job at the Wildlife Centre last week (aside from playing with the porcupine and supervising baby Canada Geese) was to reorganize the supply room. Among the usable things I brought home were FIFTEEN boxes of brand new hanging file folders, donated by someone at some time and of no use whatsoever. So far I’ve palmed off a few to our village office and the library will take more. That still leaves me with six boxes looking for a home. I still have about 150 to get rid of. I unloaded about 100, but have another box to go. I tried putting them in the lobby of our building with a “take as many as you need” sign, and I didn’t get rid of a single one. Can you believe it? Apparently overstocking is a shared curse of many offices. I occasionally take something small, too, Snosie, most recently one of a dozen rolls of calculator tape. (We’ve used less than one in the past year and a half.) I like the idea that you bring in things from home – an organic give-and-take. I suppose you’re right, Colleen, about people being reluctant to declutter at work because it isn’t “theirs.” But my job is to buy and manage supplies, so while it may not be MINE, it’s mine to do something with. That’s my job. Cindy, it would be interesting to put a ‘tag’ on one of the paper clips and record its journey from law office to law office. Today’s mini mission: after cleaning all four shelves of the pantry (several expired food items decluttered), my husband discovered an unopened box of envelopes. Yay! We thought we were out and needed to buy a box. Now we can use up this box and not have an extra one in that top cupboard hoarding space. Your comment reminds me of “Where’s George.” Do you know that site Willow? It’s for tracking the progress of money throughout the US – just for fun, of course. amazing. it also exists for euros. hilarious. I will check it out properly. Hi Cindy, I’m glad you wrote this one on stationery supplies as I particularly enjoyed the one that you wrote on paper a few weeks ago which inspired me to attack the filing cabinet. I ground to a halt for two reasons (1) it is possible the half the remainer could be moved into a concerntina file thingee and the other half digitised/destroyed and I need a few hours with the computer & scanner uninterrputed (have 3 teens) and (2) what would the printer sit on? I will push on with the idea in the mean time, there are only solutions where there is progress. And secondly, stationery is a good one for me to address in my desk at home as some months ago we eliminated the student desk that was in the same room (the kids just dumped everything on it) and I did a quick cull of the obvious debris when amalgating the two lots of drawers but definately need to revisit as there are so many duplicate items. Just a suggestion for all those dry erase markers: Find a teacher (or school) and donate the extra boxes. Some schools ration them, and I suspect teachers have to buy and pay for them out of their pockets to have enough for a school year. I really appreciate your wonderful posts. They, as well as other sites and books, have spurred me on to GET RID OF STUFF! I (we) have been successful in a lot of areas, but the one that gives me the most problems is inherited stuff. I’m an only child, and both my parents are gone now. I have in my garage a trunkful (and other containers) of sentimental and historical stuff that I seem paralyzed to dispose of. Diaries, WWI, WWII memorabilia, PICTURES!!!! (even one of Lindbergh standing on the wing of his plane), and family stuff for over one hundred years. Nobody in my family ever threw anything away! I have no other extended family remotely interested in the items, and my own children are thoroughly modern and don’t care (yet.) I find myself almost wishing for a tornado (I’m in Oklahoma) to come and take away the stuff so I don’t have to worry about it anymore! To top it off, my wife will have the same situation when her parents pass on. Hi Jeff and welcome to 365 Less Things. I am so glad you have found your way here. I hope you will find some old blog posts that will help you begin to let go of some of those things that you feel obliged to keep or are too sentimental about but really in your heart would prefer the burden lifted from you. Try typing “obligation clutter” into the search bar in the right margin of my blog and see what posts pop up on the subject. Typing in “Sentimental clutter” should also find some helpful ideas. I would suggest starting with letting go of the least sentimental things and see if your will to declutter is strengthened as you feel the freedom come over you from letting go. Just remember there are people or institutions such as museums out there who would love to have the stuff you speak of. Just imagine the joy of passing them on to someone who would enjoy them rather than being burdened by them. Funny you should mention WW1 and WW2 items as my husband has a WW1 bayonet for sale on ebay at the moment. Thank you! I will search your suggestions today. why dont you take 10 minutes a day and take a pack of pictures and sort them (if they are not sorted yet) and try to find names and sceneries and events. and make a description. That way you get that sorted and if you remember anything from your grandparents/parents stories, you can write that down. If you actually want to do that. I have a 2008 Chevy Malibu that I took to the dealers until my warranty ran out. The last time I was there, they insisted I needed the fuel injection system “blown out”. We have a garage that we have always used for our other cars and when I took it to them for confirmation, they said “WHAT!” This is a new car. After that, back I went to my garage. If it needs repairs, they will do it. It if can wait – safely – they will tell me that and give me a deadline as to how long I can delay the repair. They are great and I recommend them to all our friends. We have been going there for nearly 15 years and love their honesty and integrity. My husband just bought a new truck and is taking it to the dealer for now. Then, on to Joyce Motors after that. Everyone in our family takes their cars here and we are very pleased with them. There is something to be said for a local business who knows your car and can follow it’s progress as it ages. I love it that they know who I am when I drop off or pick up my car. I am shocked at all of those stationery stories. what are those offices thinking? I mean it might be good to have some spare items, but I am shocked that some of you are working through 7 year old supply stash. I took the advice of this blog and reorganized and decluttered my desk, when I moved. I sorted out pens that were not working, I am keeping the ones that I dont use currently in a case together. I am working on using up the old, small, tiny, or ugly ones first. Same with little paper, post its, scribble noteblocks and whatnot. its impressive how many post its I had… I am also working on those little coloured post its (for marking books/papers), some of them can be reused several times, some just loose their stickiness… otherwise I am trying to figure out what I really need and use, like sticky tape, binders, etc. Hint: Donate decluttered office supplies to any grade school or high school in a low-income neighborhood for students to use. Sadly, lawyers generate huge amounts of clutter becayse you CAN’T get rid of exhibits BECAUSE of possible appeal. This is why law offices should use attic space if possible, carefully label file boxes, and review/discard from time to time (sometimes former clients pass away).